The sound of food could affect how you experience the food! Most people have polished off a bag of popcorn during a movie, a bag of chips while watching TV, or a pizza during the Super Bowl. Mindless eating on the sofa has been identified as a major contributor to weight gain and a host of health conditions such as heart disease, high blood pressure, and type-2 diabetes. The reason why you might eat so much in front of the screen is not entirely understood. Sight, scent, and taste play a big role when you eat, but one of the most overlooked senses when it comes to eating habits is sound. It might seem strange, but does the sound of food impact how much you eat? The Sound of Food: What Happens When You Hear the Crunch? Brand new research is showing that background noise may distract you from the sound of eating, silencing subconscious cues about when you’ve had enough. 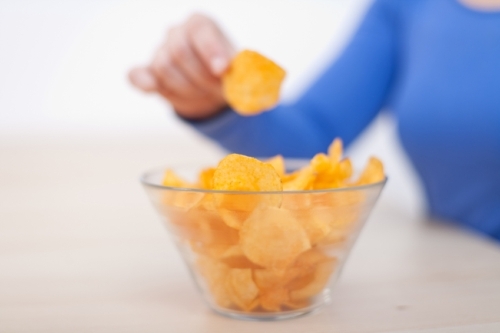 Eating food that’s crunchy, for example, can play a role in how much you eat. A recent experiment published in the journal of Food Quality and Preference studied participants who were instructed to chew loudly, softly, or pay no attention at all. In another experiment, they were given a pair of white-noise-producing headphones to wear while eating crunchy food. The sound in the headphones basically mimicked the distractions of listening to music or watching television while eating. It turned out that people who were less aware of the sound of their food ate much more, and those who focused on chewing ate significantly less. Focusing on the food or hearing the crunching sounds makes you more conscious of the act of eating, helping to prevent absentminded consumption. And although I’m not suggesting you eat in silence every day, this does lend some more support to the theory that you should eat at the dinner table, away from the noise of the television. Think about turning the TV off or turning the music down while you eat, and instead, use the time for quiet and reflection. The subconscious cues offered by the sound of food and eating can help signal when you’ve had enough, which could play a big role in controlling your appetite and weight. Elder, R. S., et al., “The crunch effect: Food sound salience as a consumption monitoring cue,” Food Quality and Preference, 2016; doi:10.1016/j.foodqual.2016.02.015. Mammoser, G., “Why You Shouldn’t Eat Dinner While Watching TV,” Vice Food web site, March 21, 2016; https://munchies.vice.com/en/articles/why-you-shouldnt-eat-dinner-while-watching-tv?utm_source=vicefbca, last accessed March 22, 2016.